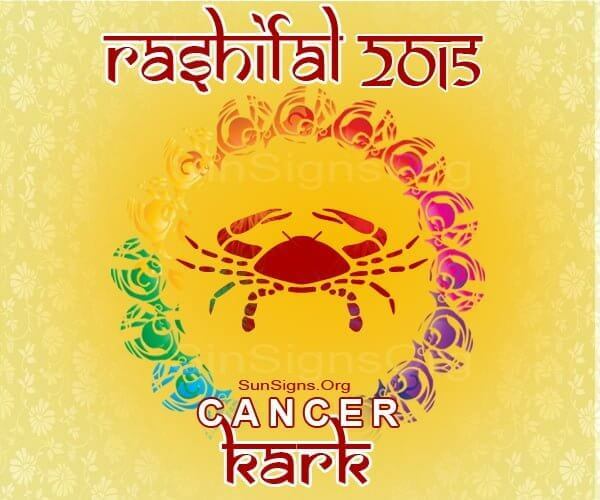 2015 Kark Rashi horoscope for people born under the Cancer zodiac sign foretells of an excellent first half in certain matters. But there might be problems during the latter part of the year. Kark Rashi natives in public life will have many chances to show their brilliance. You will make light of your competition. The Bhavishya Rasifal 2015 for Karka predicts that you have to suppress your ego and get along with people if you want to progress in your life. Religion and spirituality will be active in the day-to-day life of Karka Rasi. You may undertake a religious pilgrimage. The career forecasts by the Kark 2015 Rashifal predict that you will be creative in your thinking and will take correct decisions which will help you in your career growth. Businessmen will see success in their ventures. Professionals can look forward to promotions in their jobs. Students will make good progress in their studies. Karka Rashi 2015 financial astrology predictions forecast a superb year monetarily. However all investments should be done after proper examination. Singles in committed relationships are likely to tie the knot during 2015. They should be more flexible in their relationships. This is the only way you will find true love in your life. On the domestic front, marriage in the family is likely. There will be harmony in family relations with your siblings. The Kark Rashifal 2015 predicts some conflict with elder members of the family. Foreign travel for work and business is indicated and it will be profitable mostly. It is a good time to go on vacation with your loved ones to an exotic locale. Health will be unpredictable during this period and you may see ups and downs. Kark Rasi 2015 predictions advice you to take precautions for good health.